verum dulcibus insuper alerent venenis? Si operam medicantis exspectas, oportet vulnus detegas. 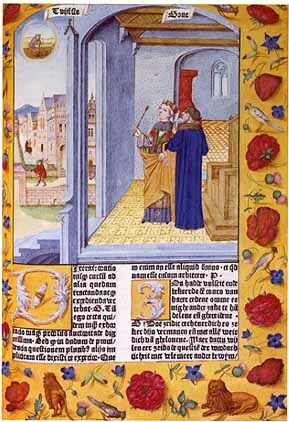 III.Boethius says he has been a good philosopher-politician. gubernacula pestem bonis ac perniciem ferrent. IV.Boethius cannot understand how evil can succeed. conceperit inspectante deo, monstri simile est. obtemperes. Tu vero volventis rotae impetum retinere conaris? 鲍依修斯最有名的话是诡论：Si quidem deus est, unde mala? Bona vero unde, si non est? good if there is not ? Price:	$259.00 & this item ships for FREE with Super Saver Shipping. Look at the paperbacks. They are regularly priced. I bought a dover edition for only a couple of dollars. And dazzles with its rays the blinking eye. If you possess yourself, you have something you will never want to give up and something which Fortune can not take from you. You mortals knows how to act justly only when you have the support of popular opinion and empty rumor; you are not satisfied with the assurance of conscience and virtue but seek your reward in the hollow praise of other men. The good is defined as that which, once it is attained, relieves man of all further desires. The only stable order in things is that which connects the beginning to the end and keeps itself on a steady course. If uncertain things are foreseen as certain, that is the weakness of opinion, not the truth of knowledge. Everything which is known is known not according to its own power but rather according to the capacity of the knower. And beyond the capacity, there are three other quadruplets: what we know that we don't know, what we don't know that we know, and what don't know that we don't know. Wow! The last two quotes by Ah Shan. I like it very much. How timely it appears to our current situation! About this solfege thing: my kid’s piano teacher teaches her 固定唱名法 which sounds very unnatural to me. For me, if you listen to a simple tune you can pretty much figure out 首调 solfege without reading the note. But if you use 固定 solfege, isn’t it just the same as singing CDE?